The animal health world will get a look at Vet Innovations’ smart feeder and BabelBark’s mobile app. 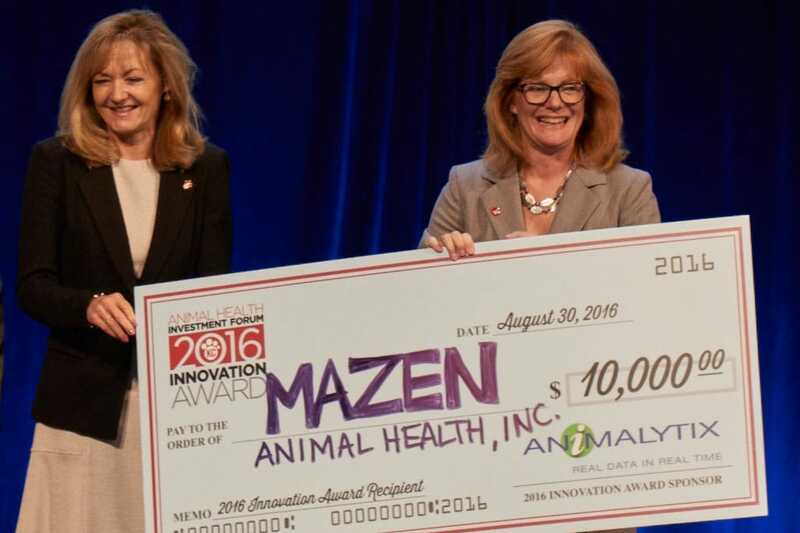 Executives from Mazen Animal Health collect a $10,000 check at the 2016 Investment Forum. The St. Joseph, Missouri, company, which produces oral vaccines for production and companion animals, was named the top presenter. Eighteen young companies with innovative ideas for improving animal health will lay out their plans to potential investors and business partners Aug. 29 in Kansas City, Missouri. The ninth annual KC Animal Health Investment Forum will give Vet Innovations Inc. the chance to showcase PortionPro Rx, which is programmed to dispense the appropriate amount of food to a specific animal and lock out other household pets. 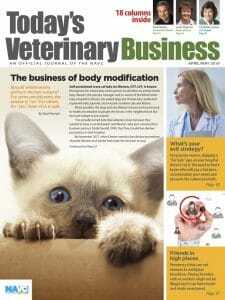 “I came up with the concept … because I saw so many clients every day who were struggling with taking weight off their pets and realized how challenging and stressful it was to comply with and adhere to my recommendations,” said Vet Innovations’ chief medical officer, Troy Hexter, DVM. The veterinary-exclusive PortionPro Rx is scheduled for release in late 2017. The Kansas City Animal Health Corridor, which organizes the Investment Forum, has not publically identified the 18 presenting companies, but the participants are free to announce their invitations. Another company set to go onstage and deliver a 15-minute presentation is BabelBark, which offers a mobile app and software platform designed to connect pet owners with veterinarians, businesses and service providers. Each presenting company, drawn from a pool of applicants, is seeking $500,000 to $20 million in funding. One company will earn $10,000 for delivering the day’s best presentation, but all 18 will pitch their ideas to more than 400 venture capitalists and industry executives in attendance. “This event gives companies and entrepreneurs, with innovations that seek to revolutionize global animal health, the resources they need to get off the ground,” said Kostas Kontopanos, vice chairman of the KC Animal Health Corridor and president of Hill’s Pet Nutrition North America.